As the mother of adult children who live over a thousand miles away, I can tell you for certain that the best gift you can give your mother for Mother's Day is the gift of your time. And an excellent way to spend some quality time with Mom is with a weekend getaway. But how do you plan for traveling with mom and where should you go? Not all moms are the same, so you will first want to be realistic about the type of destination and activities that will appeal to your mom. Things to consider include her age, mobility, appetite for adventure, and tolerance for crowds. So what does your mom like to do? If you aren't sure, ask her. I tried this with my mother thinking she would say she wanted to go to the beach. She surprised me when she said she would most like to go to London together for the theater. I had no idea! Here are a few ideas for a special Mother's Day getaway. My kids probably wish I had gone to cooking school when they were growing up, but I'm not sure it would have helped. If your mom likes to cook - or needs some cooking inspiration - consider a cooking class. The folks at Parties that Cook in San Francisco offer a Mother’s Day brunch that you cook together. You and mom will be greeted with a peach Bellini cocktail while the chef instructors go over the recipes with you. Then the fun begins where you will whip up such delicious recipes as Chorizo and Potato Spanish Tortilla Bites and a decadent Smoked Salmon Benedict where you’ll learn to make the Hollandaise sauce from scratch. There's plenty of sweetness too with a Mini Cinnamon Streusel Sour Cream Coffee Cake and Chocolate Cherry Charlotte with cream. You can walk off the calories later with a stroll across the Golden Gate Bridge. Is there a cause that is near and dear to your mom's heart? My mother is a breast cancer survivor and on her 70th birthday she asked the entire family to walk the Susan G. Komen 5k in Chicago. That race is now held on Mother's Day each year. All types of moms and families join in the walk/run to raise money for breast cancer awareness, get some exercise, and celebrate life. What better way to celebrate mothers than with a cause that helps women? And you can stop in Gino's East for a calorie laden and delicious deep dish Chicago pizza after the walk – go ahead, you've earned it. 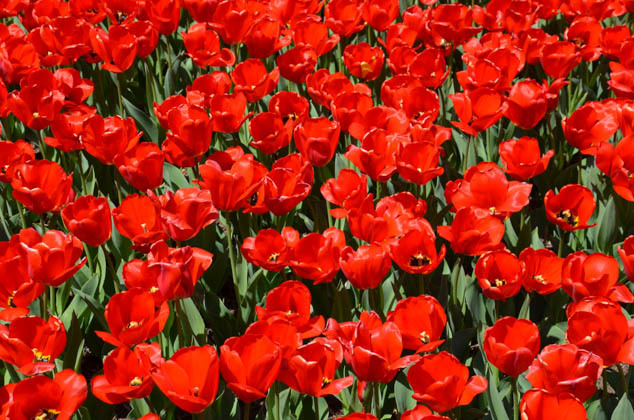 If you don't have the time or funds to take mom to Holland to tip-toe through the tulips, take her to Albany, New York where over 100,000 tulip bulbs blossom into a sea of colors just in time for a Mother's Day celebration in Washington Park. Historic events take place annually, including the scrubbing of State Street, the tradition of the Tulip Queen Coronation, Tulip Queen and Court Luncheon and Royal Tulip Ball. There are always children’s activities, craft vendors, delicious food and multiple stages with nationally acclaimed musical performances. And on Sunday – the Annual Mother of the Year Award. Does your mom love to be on the water? If so, consider a coastal destination with options for sailing. One of my favorites is Schooner Woodwinds of Annapolis, Maryland. The 74-foot schooners Woodwind and Woodwind II are replicas of the classic, fast wooden schooners that were built as yachts in the early 1900s. They were custom designed and built specifically for sailing on the Chesapeake Bay. The company offers a special three hour Mother’s Day Brunch Sail that includes a Bloody Mary or Mimosa, homemade scones, quiche Lorraine squares, baked citrus salmon, grilled flank steak, fresh fruit salad, orange juice and homemade biscotti. As you sail along, you will see the United States Naval Academy, Annapolis Harbor, Chesapeake Bay Bridge, and the Thomas Point Lighthouse. The captain will even let Mom hoist the sails and take a turn at the wheel. If Mom's up for a trip across the pond, consider a few days in London. In England, Mother's Day is held the fourth Sunday of Lent. This means no Mother's Day crowds when you arrive in May. For an elegant stay, book accommodations at the five star Egerton House Hotel in Knightsbridge. Treat Mum to high tea at Orangery at Kensington Palace where the 18th century architecture provides a magnificent backdrop. Prolong your elegant afternoon with a tour of Kensington Palace and its beautiful formal gardens. In the evening, catch a show at one of London's many theaters. Finish the evening back at the Egerton House Hotel where the barman wears a classic white tuxedo jacket and serves what is considered by some to be the best martini in London. What type of Mother's Day getaway would your mom prefer? If you liked this post, don’t miss any of our travel articles - sign up for our email notices today! Discover why it's important to travel with your entire family sometimes.